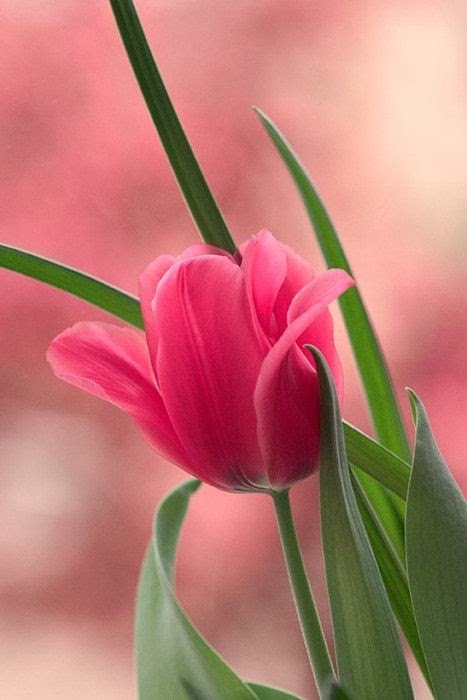 The tulip is a perennial, bulbous plant with showy flowers in the genus Tulipa, of which around 75 wild species are currently accepted and which belongs to the family Liliaceae. The genus's native range extends west to the Iberian Peninsula, through North Africa to Greece, the Balkans, Turkey, throughout the Levant (Syria, Israel, Lebanon, Jordan) and Iran, North to the Ukraine, southern Siberia and Mongolia, and east to the Northwest of China. The tulip's centre of diversity is in the Pamir, Hindu Kush, and Tien Shan mountains. It is a typical element of steppe and winter-rain Mediterranean vegetation. A number of species and many hybrid cultivars are grown in gardens, as potted plants, or to be displayed as fresh-cut flowers. Tulip cultivars have usually several species in their direct background, but most have been derived from Tulipa suaveolens, often erroneously listed as Tulipa schrenkii. Tulipa gesneriana is in itself an early hybrid of complex origin and is not the same taxon as was described by Conrad Gesner in the 16th century.